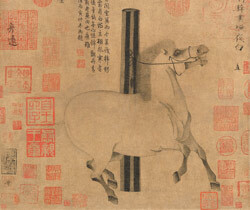 Han Gan, a leading horse painter of the Tang dynasty (618–907), was known for portraying not only the physical likeness of a horse but also its spirit. This painting, the most famous of the works attributed to the artist, is a portrait of Night-Shining White, a favorite charger of Emperor Xuanzong (r. 712–56). The fiery-tempered steed, with its burning eye, flaring nostrils, and dancing hooves, epitomizes Chinese myths about imported “celestial steeds” that “sweated blood” and were actually dragons in disguise. Han Gan is also said to have preferred to live in the stables rather than in the Emperor’s household. This entry was posted in This Dew-Drop Bardo and tagged Chinese painting, dragon, drala, Han Gan, horse, Night-Shining White, painting, Tang Dynasty, windhorse. Bookmark the permalink.